I grew up religiously watching David Attenborough nature shows every Sunday night before bed time and without fail, my favourite episodes were the ones where he spent time in the Amazon Jungle (I think my fascination with ants started there!). So when my travels brought me to the Peruvian section of this magnificent rain forest, the word “surreal” doesn’t even begin to describe my experience. Flying into Puerto Maldonado airport is somewhat reminiscent of an Indiana Jones movie! The dusty, rust coloured runway is surrounded by dense jungle and the main terminal is not much more than a converted hangar. Having come from the lofty altitudes of Cuzco, high in the Andes, the heat and humidity hit us immediately, and the sounds of the howler monkeys watching us collect our luggage reminded us we were very far from home. Puerto Maldonado is a town of about 100,000 people sitting at the confluence of the Tambopata and Madre de Dios rivers, both tributaries of the mighty Amazon. Other than the mini buses picking up tourist groups from the airport, the only vehicles allowed in the town centre are motorcycles. And there are a lot of them – motorcycle taxi drivers jostle for business, families pile on to rusty mopeds, clouds of red dust are kicked up by the dirt bikes racing by. This city is never quiet, and I loved the bustle of the public market and roadside food stands. A rickety mini bus picked up our weary group and we were bounced and jostled under a sprawling jungle canopy to the Tambopata River where we met our motorised canoe. We started out on our 2 hour ride on the sedate, muddy brown water, caimans eyeing us suspiciously from the sloping banks, macaws gracefully gliding overhead. We had to keep reminding each other that we were actually here, we were truly in the heart of the largest rainforest in the world. As we arrived at our home for the next 2 nights, a basic but stunning lodge on the edge of the river, the cooking crew were chasing a few cheeky members of the resident howler monkey troop out of the kitchen! Our rooms were in small cabins set back into the jungle. With just screens on the windows and large gaps between the wooden slats in the floor and walls, we were given strict instructions on how to check our clothes in the morning for unwanted guests. Most of us made the decision to put our shoes inside our mosquito nets to avoid any surprises! The only electricity was in the main lodge house so we made our way over there for an early dinner, a delicious buffet of local fare. A resident herpetologist gave a fascinating talk about the local fauna and got us very excited about the prospect of maybe spotting a magnificent anaconda. After dinner we were given the option of taking a walk along the trails around the lodge but it was already dark, we were tired, and we were not yet particularly comfortable with our surroundings. Instead we chose to take a wander out to Sunset Point, and it didn’t disappoint. Watching the sun sink behind the jungle canopy as it turned the river fire orange and listening to the incredible jungle sounds was just the end to the evening we needed. Finally, fresh air and excitement took it’s toll, and even having our guide point out the dinner plate sized tarantula that lived under the overhang of one of the cabins didn’t stop us all from falling into a deep sleep. 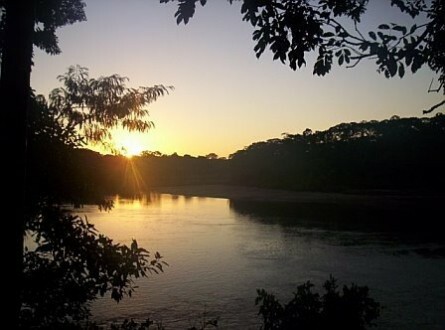 Very early the next morning we were awakened by the Amazon’s own alarm clock…howler monkeys. For those of you who have never heard their unique call, I don’t know that any description can do it justice. It is odd and loud and persistent and it made sure we were up and ready for our hike that day. Our guide, Jin, met us after breakfast and we headed into the jungle along roughly cut trails. Jin was a local, and his extensive knowledge of the local plants and animals was outstanding. Pointing out animals in the canopy that we would probably never have noticed, he showed us Golden Marmosets, Dusky Titi Monkeys, Red Howler Monkeys, Toucans and Macaws. Fire ants, bullet ants, army ants, leafcutter ants, community nest spiders and enormous butterflies the size of a frisby were all spotted on our 10 kilometre hike. The oxbow lake that was our destination was home to a family of Giant River Otters, and we spent a long time in a hide watching these beautiful, endangered creatures. Finally we hopped in canoes and slowly made our way around the edge of the lake, careful not to put our hands in the water, very conscious of the schools of piranhas going into a frenzy every time something hit the surface. That evening we were invited to take a boat out after dark to go caiman (a four-legged reptile, of the alligator family) spotting. We jumped at the chance and it truly was a magical experience. Once again, Jin astounded us with his observational techniques, diving out of the boat at one point to grab a 6 month old black caiman and bring it on board for us to all have an up close experience! After a few minutes we released the magnificent creature and watched as he swam away with no ill effects. Using powerful spotlights to shine on the river surface, we picked up the telling eye shine of the adults floating on the surface or lazing on the river bank. A couple of curious peccaries, the 2nd largest rodent in the world, came to the water’s edge to check us out. Then, at the request of a research team sharing the river with us, we were asked to turn off all lights and the engine as they did depth sounding. Now we were floating in pitch black: the Southern Cross constellation shining brightly through the break in the canopy, bull frogs calling to potential mates, monkeys chattering to each other overhead. When asked to pick out a favourite moment from my travels, this one is usually top of the list. The next morning our canoe transfer back to Puerto Maldonado was early. As the humidity increased, mist rose from the surface of the river, giving the ride a slightly other-worldly feel. A pair of bright red macaws flew above us in formation, and tears flowed as the full scope of the experience hit me. A childhood wish to one day step foot in the Amazon had just been fulfilled, and I knew that my life would be forever enriched by this breathtaking journey.